What Happened The Last Time AT&T Had A 6.5% Dividend Yield? As I write this, shares of Texas-based telecommunications giant AT&T (T) last traded hands at $30.63. That’s within whispering distance of not just the security’s 52-week low, but even the stock’s 5-year low share price. In turn, you have some interesting metrics that accompany this type of price action. For starters, AT&T has reported adjusted earnings per share of $3.44 on a trailing basis. Against a current share price of $30.63, this equates to a trailing multiple of just 8.9 times earnings. On the dividend front, AT&T just paid its fourth $0.50 quarterly dividend or $2.00 on an annual basis. This works out to a trailing yield of ~6.5%. Both of these numbers are eye-catching, especially when you compare it to the general market. History does not dictate the future, but there are still many insights that you can glean from the above table. Note that all the figures are using year-end data, with the exception of the “current” row. Looking at the payout ratio, AT&T has shown tremendous improvement. Starting with the dividend raise in 2009, the company has been increasing the quarterly payout by just a penny or $0.04 on an annual basis. So the per share dividends paid equaled $1.60 in 2008, followed by $1.64 in 2009, $1.68 in 2010, and so on up to $2.00 even this year. The compound growth rate of the dividend since 2009 has been about 2.2% per annum. On the other hand, earnings per share have grown at a faster rate since 2009. In turn, the payout ratio has steadily improved from 77% all the way down below 60%. The P/E ratio tells a similar story. From 2005 through 2017, shares of AT&T have traded hands in the 10 to 15 times earnings range, with something in the 12 to 14 range being quite typical. Only lately has this multiple dropped into the single-digits as the share price has decreased significantly and earnings are still marching upward. Finally, the dividend column is instructive as well. It tells a similar story in that we’re presently looking at a “high” current dividend yield. However, it also shows that it has not been unusual at all to see shares of AT&T trade with a 5%+ yield. This brings up an interesting question: “What happened the last time AT&T traded with a 6.5% yield?” From the table above, we don’t have a comparison. However, we can look to the depths of the recession of early-2009. 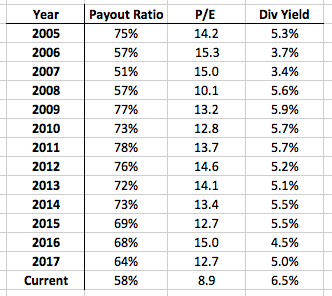 At that time, AT&T was paying a $1.64 annual dividend and the share price got below $25, equating to a ~6.5% starting yield (with a P/E of ratio of ~9). I’ll save you the suspense and cut to the punch line: had you purchased shares of AT&T in January of 2009, approximately when shares last yielded 6.5%, your total return to today would be about 7.2% per annum. As a point of reference, that means your starting investment would have nearly doubled. Now, this is a fine result – certainly better than sitting in cash for the last decade. However, I would argue that it is a bit surprising. Here you would have purchased shares that looked like a real bargain: selling ~40% below the share price of a year earlier, trading with a 6.5% yield and at just 9 times earnings. Yet the returns since that time were unspectacular. On the positive side, the dividend income turned out to be fantastic. You started with a 6.5% current yield and this grew to a ~8.1% yield on cost. During the last decade, you would have collected approximately 75% of your starting capital back in the form on cash dividends alone, and that’s prior to thinking about reinvesting. On the other hand, there were two offsetting factors. The business grew during this time, but not very fast. AT&T was a dividend giant, but a slow overall grower due in various degrees to the industry, debt load, and above average payout ratio. Moreover, from early 2009 to today, investors have not seen valuation improvement – with shares moving from ~9 times earnings to ~9 times earnings. Your result would have been better had you sold shares a year or two ago, but alas we don’t have the benefit of hindsight bias. These are important takeaways. It shows that there’s a bit more to it than “buying a bargain.” Even if you pick the “perfect” time to invest, this may or may not lead to outsized results, depending on the business and valuation of the future. Looking forward, this type of framework can prove beneficial from a psychological standpoint. Today, it is not difficult to put together a strong investment thesis for AT&T. Here I’ll show you. The company has told investors to anticipate ~$3.50 in earnings per share this year and the expectation is for the company to grow that number by low-to-mid single-digits over the intermediate-term. For our purposes, we’ll use say 3% annual growth leading to the expectation of ~$4.05 in earnings per share after five years. As noted above, AT&T’s “typical” earnings multiple has been somewhere in the 12 to 14 range, absent the last year or so. If we use 12.5 times earnings, this would equate to the potential for a future share price of ~$51. If the dividend increases by a $0.04 per share, this would mean anticipating ~$10.60 in dividends per share over the coming half decade. Put together, you have the potential for a value of ~$61 – keeping in mind that this is simply one hypothetical out of a vast amount of possibilities. Against a current share price under $31, this $61 scenario would imply returns of almost 15% per annum. This is what I mean when I suggest that it is not particularly difficult to make a strong investment case for AT&T today. A well-above-average dividend yield, coupled with a small amount of earnings improvement and multiple expansion could lead to exceptional results. Of course, I went through the beginning illustration for a reason. Just because shares of AT&T are trading at a historically low P/E ratio and historically high dividend yield, this does not necessitate that above-average returns await. Just like in the 2009 through 2018 stretch, you can have factors that do not perform as well as anticipated. For instance, if AT&T were to pay the same well-above-average dividend but grow by 2% annually and later trade at 8.5 times earnings (instead of 12.5) your annualized return expectation would be 7.2% per annum – the same result that the 2009 through 2018 investor experienced. I find this instructive. An investment in AT&T is based, in my view, on three factors: business growth, the above average dividend, and future valuation. If AT&T keeps paying its dividend (and raising it), today’s investor stands to collect a torrent of cash over the coming years. Today, there aren’t a whole lot of places to find a 6.5% and growing yield. Yet it’s just as important to keep in mind that this factor alone does not necessitate exceptional returns. If your sole focus is cash flow generation, that’s not a large concern. Just like you wouldn’t be particularly concerned about what someone may or may not be willing to buy your rental property for if it’s generating solid cash flow. However, if you’re coming at the investment from a total return basis, there are additional considerations that come into play. Some growth is anticipated from AT&T, but not an exceptional amount (especially in light of the debt load and industry). In this way, whether or not AT&T turns in reasonable gains or excellent returns will likely depend on the security’s future valuation (whether it trades at say 8 times earnings or 13 times, as an example). And as we have seen, this part is both unknown and finicky. In short, the last time AT&T had a 6.5% yield (and traded at 9 times earnings), the cash flow generation was superb, but investor returns have not been impressive. Moving forward, this is an important thing to keep in mind. Today, the cash flow generation is once again set up to be impressive, but overall returns will be driven to a large degree by the change (or lack thereof) in valuation.